HUF reminds of the meeting for companies at 11 and meeting for associations at 13. Both at Prästgården. This year easter Lunchen will be in Byviken close to the Mail Rowing Boathouse. Set the buffet table from 12 and start at 13. Meetings with the authorities. Read more at the KOM-group webpage (in Swe). Now, the first updates of the calendarium with summer events. Go to the Calendarium (in Swe)! Todays morning, the ferry traffic has been resumed according to schedule. Due to the current weather situation, the ferry tours are cancelled. Due to the coming up hard wind and snowfall, there will be a change of ferry from Capella to Helena Elisabeth. On Second Day Easter 22 April, HUF invites all companies on Holmön to a meeting to discuss how we can get a better cooperation. Meet up at 11 in Prästgården. 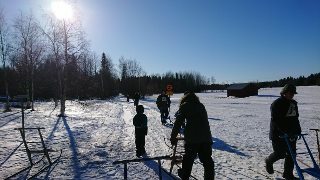 During the winter, Umeå Energi has looked at various suggestions to supply Holmön with broadband via a radio solution. They have studied similar cases and will now offer an agreement for this. The agreements for filber will be closed and an offer with this new agreement will be sent out to all, who signed agreements for fiber. The price will be the same. The terms in the agreemnet will be different, for example it will be possible for a customer to end the agreement if not the agreed speed can be ackompished e t c.
in due time. Umeå Energi will send an e-mail to all who have signed intererst for broadband. More info will follow in due time. The wind gust from last evening and night has eased off. The ice in Kvraken has drifted away and the condintion are good. The ferry traffic will be resumed accordning to schedule from this afternoon, with first departure at 16.00 from Norrfjärden. The change i wind direction late this afternoon has filled Kvarken with close ice and stopped the Late tour with the ferry from Norrfjärden. The ferry had to turen back to Norrfjärden to avoid to get stuck in the ice. Tomorrow morning there will be helicopter tours. The wind will ease off during the night and tomorrow morning the crew will try to open tha track aganin. From this afternoon, the ferry traffic will be resumed with depature at 16 from Norrfjärden. It will be Helena Elisabeth that will begin the traffic. There may be disturbances in the traffic due to drifting close ice. HUF reminds of the meeting for associations at Prästgården at 13.00 on Saturday. Read invitation (in Swe). 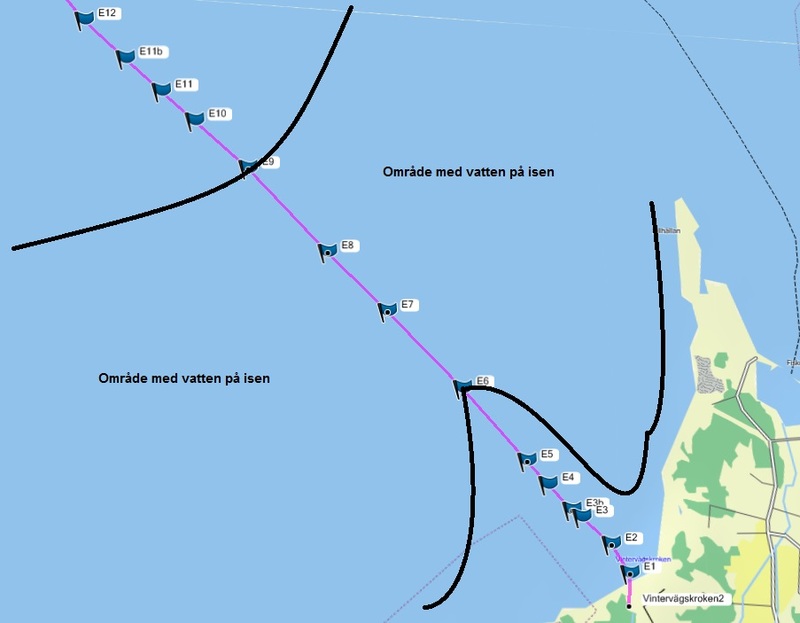 Thetis is now on route to Kvarken to break up for Capella and Helena. At the moment north bound east of Ängesön. Estimated arrival to Byviken around 17.00. The crew will go out with Capella and with assistance from Thetis atempt to reach the jetty in Byviken. The plan is to take Helena out and start up the traffic with her. 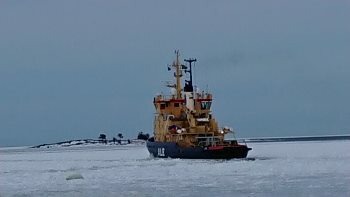 As soon as the wind changes to souyherly wind, the icebreaker Thetis will com and break up the ice in Byviekn and a new attempt to take Helena out will be made. The forecast for wind change is on Wednesday. Todays morning, the helicopter tours were resumed after the snowfall that started on last Thursday. 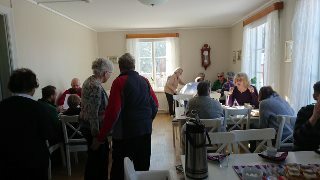 The KOM-group has has a meeting with Lässtyrelsen regarding the traffic to Holmön. Today it was decided to cancel the helicopter tours today (Thursday) afternoon, Friday and Saturday. If the weather improves maybe flying can be resumed on Sunday. The weather forecast for the coming days warn for hard notherly wind with gusts up to 25 m/s and snowfall. This may cause disturbance in the traffic to Holmön the comming weekend. Mos likely, several helicopter tours will have to be cancelled. The weather was sunny and nice but there was a bity notherly wind. The track had been changed this year due to bad condtions for kick sledge on the road. The tack went along the Bastulönnvägen and Åkervägen on the frozen snow crust. At Grubbströmsbacken there was liquid control with blueberry soup. The back the same way. After there was semlor, medal cermony and raffles. Thanks to Ulla, Gunborg and Elise from Holmöns Red Cross for an, as always, nice event. The kick sledge reace this year will be on the frozen snow crust. Start on Bastulönnvägen below Prästgården. Then to right after Tommys place and down to Åkervägen passing ödekyrkogården. Then follow the snowmobile track northwards to the road crossing towards the church. There will the liquid control with blueberry soup be. The back the same way to have one of Elises fabolus semlor. Helicopter will fly accordning to previous announcements during coming week until the ferries can be in traffic. The notherly wind the past day has compressed the upbroken ice in Byviken. An attempt to get out will be made with Helena. If that is unsuccessful, assistace from Ale will be requested. On Saturday 23 March, HUF invites all associations on Holmön to a meeting to discuss how we can get a better cooperation between the assiciations. Meet up at 13 in Prästgården. 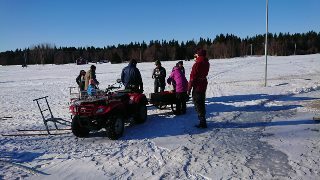 Today after lunch, Ale came and broke up the ice in Byviken outside the piers. At the same time, a crew man came with the first helicopter transport to start up Helena and begin to break her out from the 50-cm ice where she is frozen in at the jetty. They will work the whole afternoon and evening and continue tomorrow until Helena reaches open water. There will be helicopter transports also on Saturday. A crew to Helena will come with the helicopter this afternoon and start to break her loose. 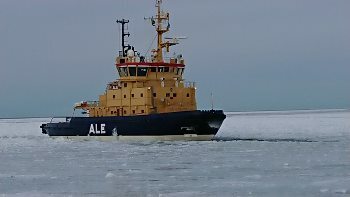 Ale will come in connection with assistance to another ship close to Holmön. Unclear when, maybe already this afternoon. There will be helicopter transports on Friday afternoon and on Sunday, maybe also on Saturday. Peter Tornberg, tel 070-6908503, will answer questions regarding schedule and booking. As soon as possible the icebreaker Ale will come and assist to break up the ice for the ferries. Unfortunately, the ice has deteriorated too much to keep the snowmobile track open, which now has been closed for the season. The track was open for one month this winter. The hovercraft will contrinue the traffic at least up to next week (if not the ice breaks up). 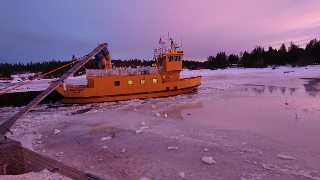 Depending on if the ice breaks up or remains, on Monday a decision will be made if the ice will be broken up to get the ferries in traffic or continue with the hovercraft. When the hovercraft traffic ends, there will be helicopter transports until one of the ferries is in traffic. The forecast shows increasing wind and mild temperature. Not until Thusday evening there will be freezing temperatures again. Therefore, we take one day at the time and close the snowmobile track during night, when it is dark. If all looks OK next morning, the track can be opened again. Read more at the KOM-group webpage (in Swe). The night has passed and the ice remains. No significant change has occured. The conditions are icy and sharp, which gives poor friction and increased durance on the snowmobiles. Walking with shoe irons will be better than skiing. The snowmobile track is open again. The north ice edge is coming closer and is now visible from the snowmobile track. The forecast for this evening and night is hard west wind. The snowmobile track is therefore temporarily closed the coming night. If all looks OK tomorrow, the track will be opened again. An ATV digs more and has more pressure on the ground surface. This leads to that the surface has easier to break than with a snowmobile. The picture is from lunch time today and shows what happend when someone drove an ATV on the track in the morning today. Please do not drive with ATV on the track. Now is the broken propeller on the hovercraft fixed and the traffic will be resumed tody Sunday with the 16-tour from Norrfjärden. In a path along the sea current zone in West Kvarken, water has flooded the ice. The path is as narrowest where the snowmobile track coss the path (approx 1 km wide). Both norsth and south of the snowmoible track, the area with water is much larger. The borders change continuously with the mild temperature. Be ware that the conditions on the snowmobile track can deteriorate and decrease the passagebility. Färjerederiet is responsible for traffic with ferry and hovercraft on the Holmön route. All other services like thesnowmobile track, helicopter transports, goods transports with snowmobile are managed by Trafikverket and are purchased from other actors. For these issues (helicopter, snowmobile etc) contact Trafikverket. Contact person is Karin Bergenås, tel: 010-1242065, mobile: 070-7246059, e-mail: karin.bergenas@trafikverket.se. It turned out to be technical problem with the helicopter too right now, so there were no transports yesterday afternoon and this morning. It is unclear when the helicopter or hovercraft can be back in traffic. Technical problems stops the hovercraft and the traffic is cancelled from this afternoon. From tomorrow morning Thursday there will be helicopter transports until the hovercraft is back in traffic. Weekdays departure from Norrfjärden at 6.30, 8.30, 16.00 och 18.00. Departure from Holmön at 7.00, 9.00, 16.30, and 18.30. Saturday departure from Norrfjärden at 7.30, 9.30, 16.00 och 18.00. Departure from Holmön at 8.00, 10.00, 16.30, and 18.30. Sunday departure from Norrfjärden at 8.30, 10.30, 16.00 och 18.00. Departure from Holmön at 9.00, 11.00, 16.30, and 18.30. Weekday departure from Norrfjärden at 6.30, 8.30, 16.00 och 18.00. Departure from Holmön at 7.00, 9.00, 16.30, and 18.30. Saturday departure from Norrfjärden at 7.30, 9.30, 16.00 och 18.00. Departure from Holmön at 7.00, 9.00, 16.30, and 18.30. Sunday departure from Norrfjärden at 8.30, 10.30, 16.00 och 18.00. Departure from Holmön at 7.00, 9.00, 16.30, and 18.30. There are several advantages with this change. The times fits better with the busses, commuters will get to work earlier and home earlier and the staff may end work earlier in the evening. Trafikverket purchase traffic with ferry and hovercraft on Holmön track from Färjerederiet. All other services, such as snowmobile track, helicopter transports and cargo transports with snowmobiler, are purchased by Trafikverket from other actors. Färjerederiet their staff can therefore not answer questions other than those in relation to Färjerederiets agreement with Trafikverket. For other questions (helicopter, snowmobile etc), refer to Trafikverket. Today persons tansports are made with helicopter and cargo with snowmobile on the snowmobile track. The weather has admitted that flying can be resumed from Monday afternoon. Peter Tornberg, tel 070-6908503, will answer questions regarding flytimes and handle booking for helicopter and cargo transports. The traffic with the hovercarft for persons can hopefully begin this week. After this weekends snowstrom, the track needs to be prepared and also give time for the ice thickness to grow. Notice will come as soon as the traffic can begin. When the hovercraft traffic starts the hovercraft will follow the ferry schedul with a slight adjustment. Weekday departure from Norrfjärden at 6.30, 8.30, 16.30 och 18.30. Departure from Holmön according to ordinary schedule. Saturday departure from Norrfjärden at 7.30, 9.30, 16.30 och 18.30. Departure from Holmön according to ordinary schedule. Sunday departure from Norrfjärden at 8.30, 10.30, 16.30 och 18.30. Departure from Holmön according to ordinary schedule. 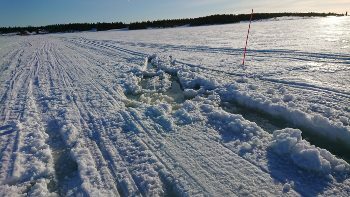 The visibility out on Kvarkens ice is often no more than 50 m, due to snowfall and hard wind with drifting snow. This mean that it can be hard to see next marking stick along the snowmobil track. It is, therefore, easy to get lost. Avoid to go on the track with this poor visibility. The condition is also poor with drifting snow and dune formation.